The Wendell Mansions apartment building was originally constructed in 1906 along Massachusetts Avenue and designed in the beaux arts style by Baltimore architect Edward H. Glidden. It was best known as the social center of the Kennedy Administration, with a Supreme Court justice, Cabinet members and the Kennedy’s Social Secretary as owners of the four full-floor apartment units. 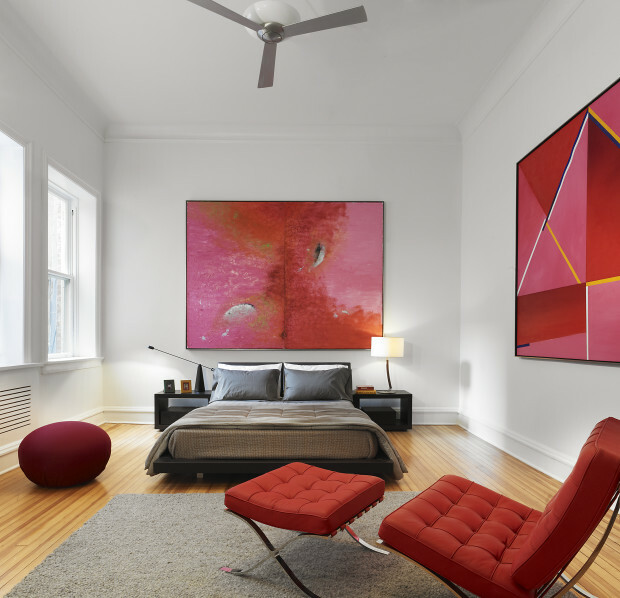 In 2013 owner, architect, and artist Suman Sorg renovated this 4.000 square foot unit. 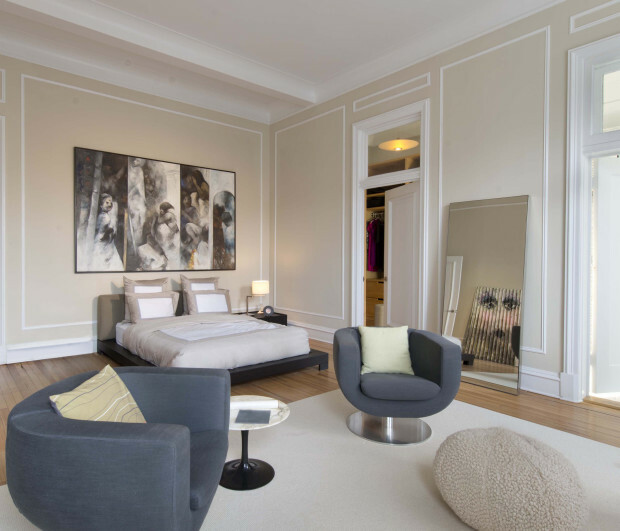 The goal and unique challenge in renovating this apartment was deciding how to accommodate the modern tastes, display and studio requirements of the owner Suman Sorg, an artist and architect engaged in large-scale oil painting; while honoring the historic character of the home. 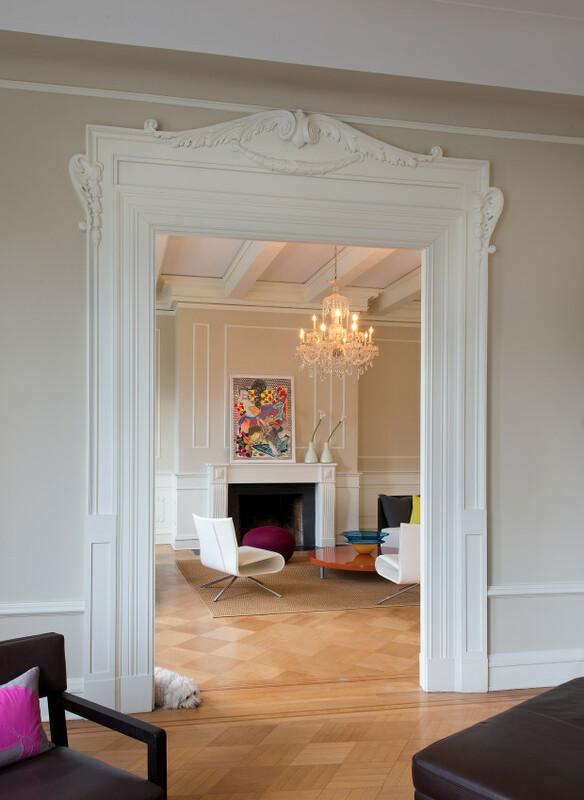 To achieve this, Sorg designed a minimally intrusive historic renovation for the living, dining and sitting room. Utilizing a more modern approach in the kitchen, Sorg removed half of the west wall and replaced the section with a floor-to-ceiling glass panel. 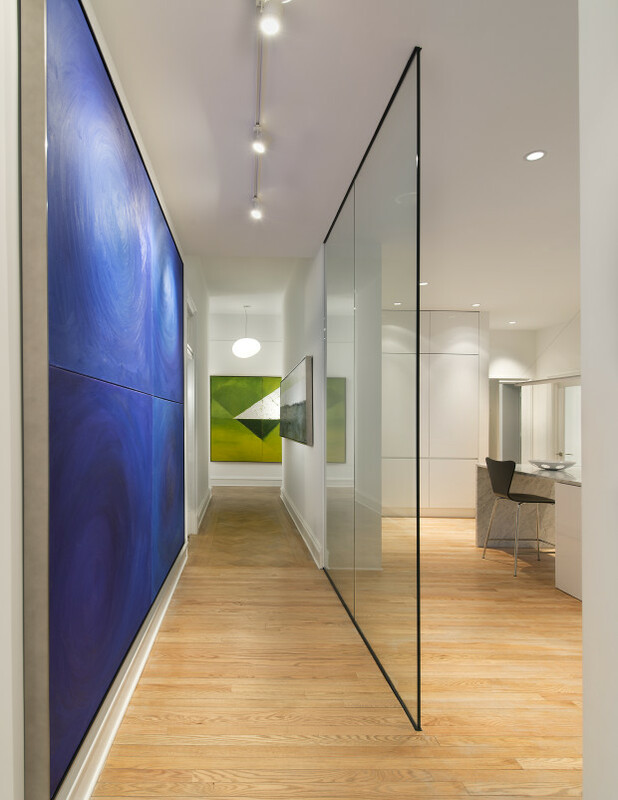 This technique allows light from the kitchen windows to flood the hallway and helps highlight adjacent artwork. Sorg merged small rooms in the back to create an artist’s studio that holds large scale paintings and leads to the apartment’s terrace. 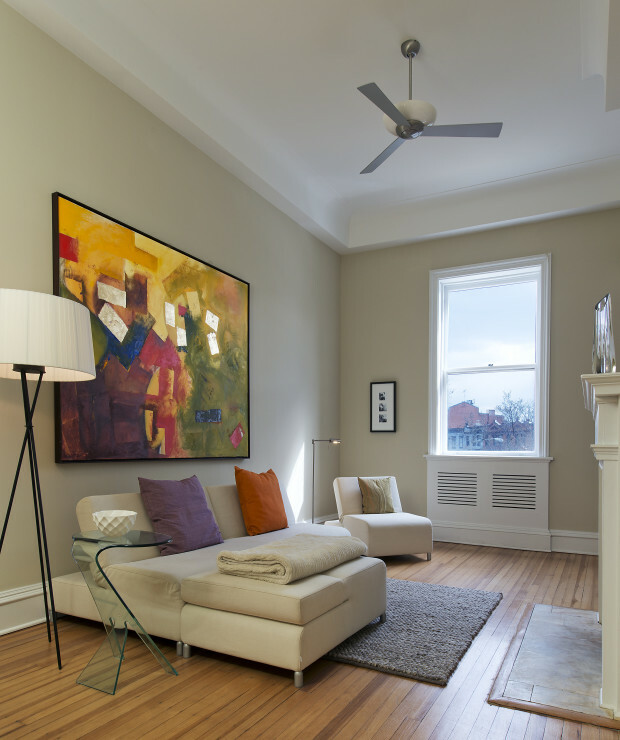 This welcome modern insertion into an elegant historic living space makes this home exemplary of urban living. The collaboration between both artists is one that stems from years of experience working together. 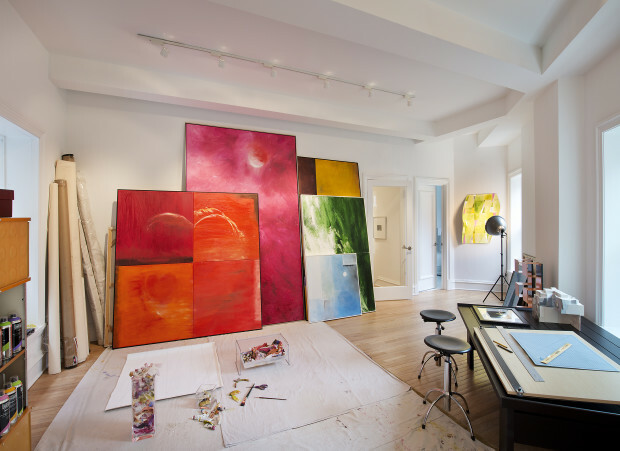 After the design of the space was complete it was important for Suman to collaborate with a photographer like Anice Hoachlander who could simultaneously capture the atmosphere of historic details and large scale abstract paintings. To fulfill this goal, the architect walked the space with the photographer and told the story behind her vision and intentions. From that information Hoachlander dictated the cameras position in ways that would capture the important details. “I was looking at it from an architectural point of view. Being able to use the artwork as spots of color and creating dynamic views down the hallway was an integral part of the photograph. I was so interested in the artwork and the way natural light illuminated the space. It became part of the overall design and composition,” said Hoachlander. The architect and photographer have collaborated on previous projects and their knowledge of each other’s design aesthetics was crucial to properly convey the art integrated in this project. The large scale paintings are oil on canvas and are about 243.8cm X 243.8cm in size.